Before going to the airplane, the pilot should check the POH/AFM performance charts to determine the predicted performance and decide if the airplane is capable of a safe takeoff and climb for the conditions and location. [Figure 5-2] High density altitudes reduce engine and propeller performance, increase takeoff rolls and decrease climb performance. 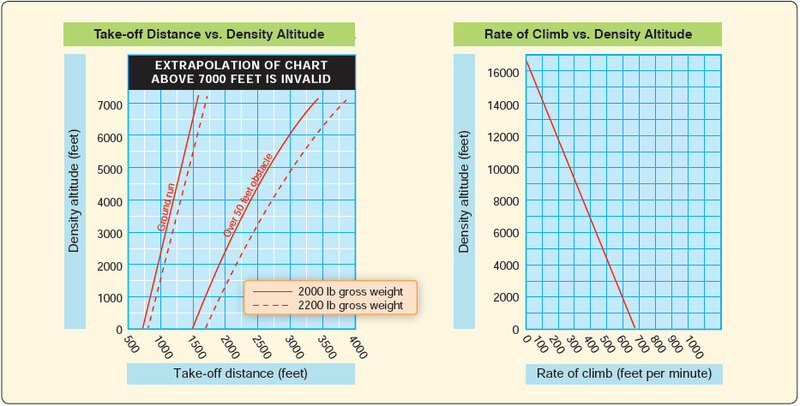 A more detailed discussion of density altitude and how it affects airplane performance can be found in the Pilot’s Handbook of Aeronautical Knowledge (FAA-H-8083-25, as revised). Figure 5-2. Performance chart examples. All run up and pre-takeoff checklist items should be completed before taxiing onto the runway or takeoff area. As a minimum before every takeoff, all engine instruments should be checked for proper and usual indications, and all controls should be checked for full, free, and correct movement. In addition, the pilot must make certain that the approach and takeoff paths are clear of other aircraft. At nontowered airports, pilots should announce their intentions on the common traffic advisory frequency (CTAF) assigned to that airport. When operating from a towered airport, pilots must contact the tower operator and receive a takeoff clearance before taxiing onto the active runway. It is not recommended to take off immediately behind another aircraft, particularly large, heavily loaded transport airplanes, because of the wake turbulence that is generated. If an immediate takeoff is necessary, plan to minimize the chances of flying through an aircraft’s wake turbulence by avoiding the other aircraft’s flightpath or rotate prior to the point at which the preceding aircraft rotated. While taxiing onto the runway, select ground reference points that are aligned with the runway direction to aid in maintaining directional control and alignment with the runway center line during the climb out. These may be runway centerline markings, runway lighting, distant trees, towers, buildings, or mountain peaks.